On my Design Wall today is Kolada. Joy D came up with a great "K" name...thanks a bunch! The small blocks are pineapple slices that finish at 1/2". This block is what drew my attention to take the class using my favorite Bloc-Loc Rulers. 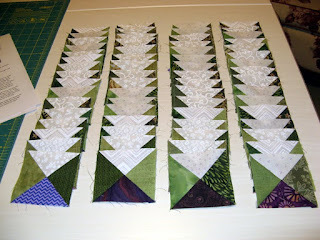 Today has me working on the last two small blocks. 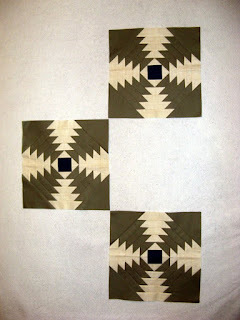 My project will be a small wall hanging that matches the colors of my decor. I have in mind a sashing as in the dark blue center of the large block. That's it for me today. 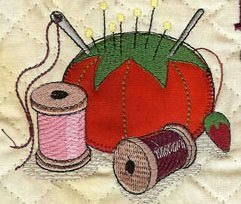 Hope you have been able to sew this past week and are making progress on something special. 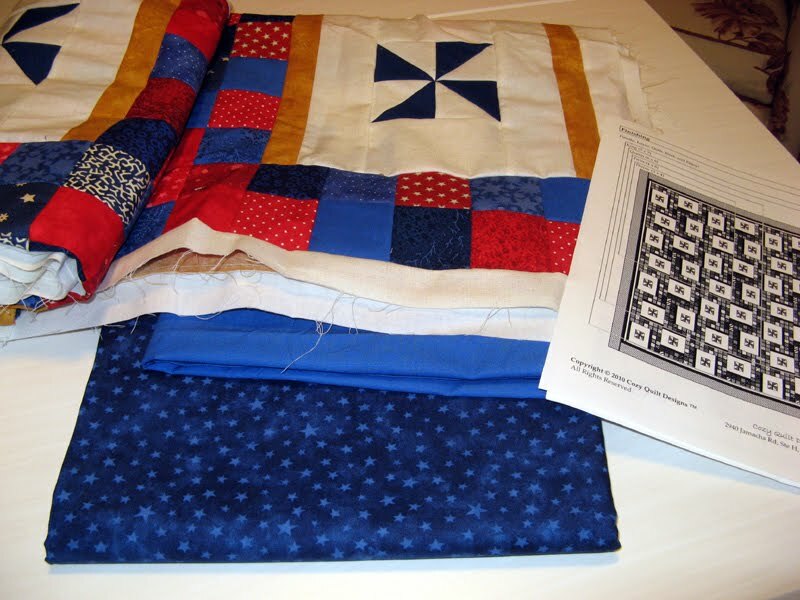 See more projects at the links on Patchwork Times. Everything is as it should be with a couple of changes around the house. There are new shelves in place to hold my Alley Cats, the stairwell alcove has a new look, the guest bedroom has new swags, and the exercise room has a different arrangement. I have a few days to sew now that the unpacking is complete. Friday brings my brother and sister-in-law for a four day visit. I'm thrilled they have some time with us before they set sail on a week long Caribbean cruise. 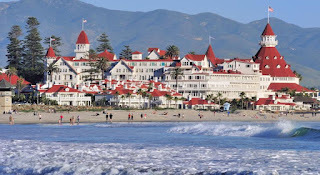 Hotel del Coronado will be one of our destinations this weekend. See what is going on with stash elsewhere through the links at Patchwork Times. Enjoy your week. My Design Wall doesn't have much activity lately. I cleared it off over a week ago, threads and all, in preparation for carpet installation that took place last Friday and Saturday. The photo above is what was accomplished at the workshop A Tarted Up Pineapple taken at Road to California on Wednesday. I am at Round 5 of the smaller pineapple block with five more rounds to go. 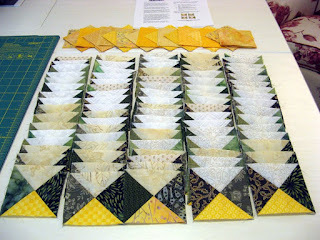 I will be making three of these blocks. Just now noticing that I made four...oops! 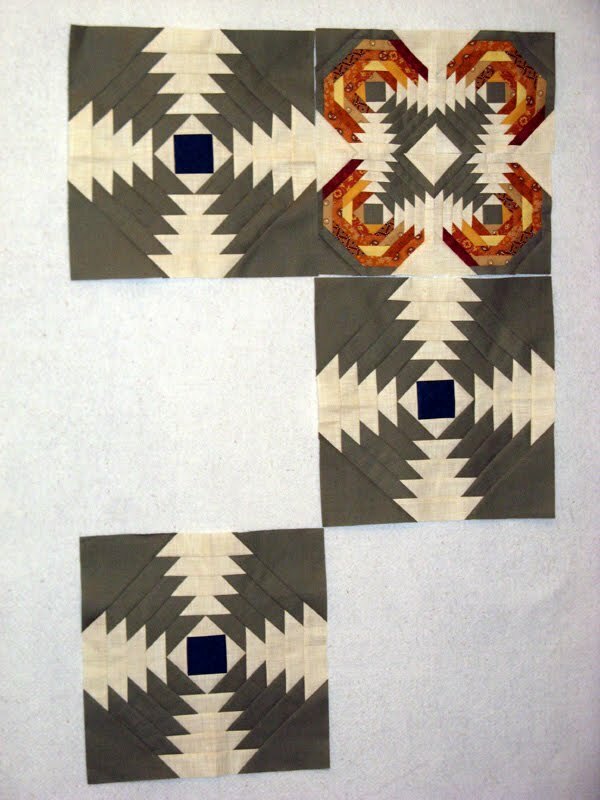 The project is much larger; mine will be a wall-hanging with a total of six blocks (three of each kind) and a border. 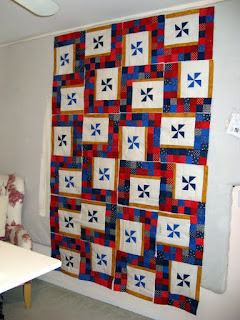 The three larger blocks are now on my Design Wall and this kind is finished. The smaller pineapple block takes quite a bit more time. Both kinds of blocks use the Bloc Loc Pineapple Ruler. You can just about make it out in the first photo. I will be sharing more on this project as time goes by. Now...how about a "K" name? We are having some very wet weather lately in San Diego. 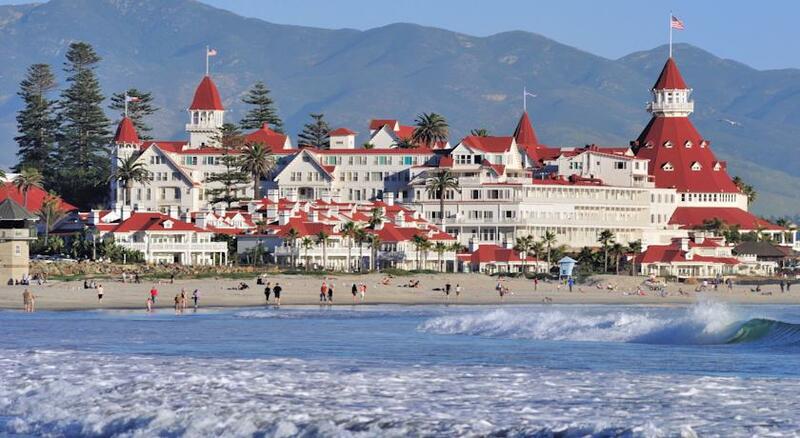 We need it to resolve the drought, but it sure isn't the typical San Diego weather! 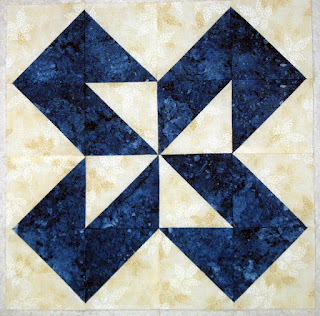 See more projects via the links at Patchwork Times. This and the next couple of purchases are from Beverly's. They were made last Sunday after the stats were posted. Above are fabrics for the class A Tarted Up Pineapple that I took on Wednesday at Road to California. Above blue star fabric is for the last border of Kozy Korners. I am hopeful now that Road to California is behind me and the carpet has been installed to get back to this 2016 UFO Project. 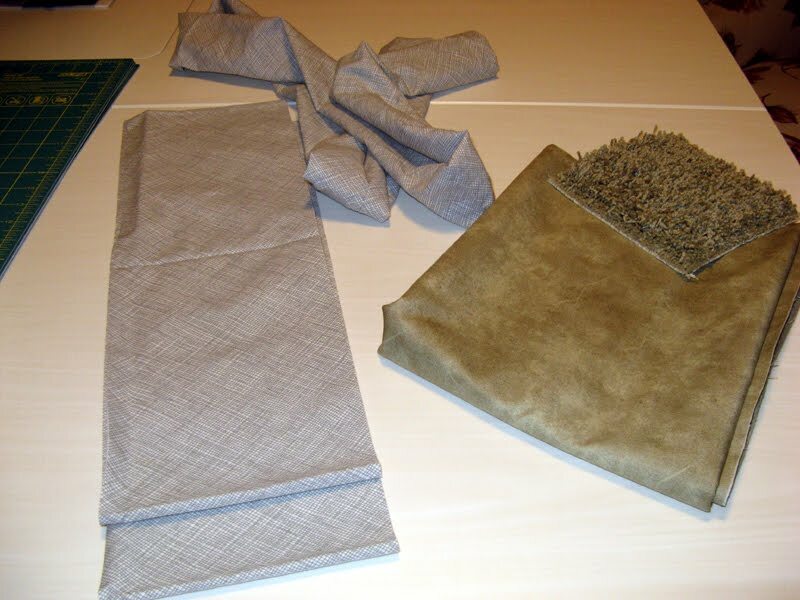 I have not yet had an opportunity to stitch the cloth cord covers that the green fabric on the right is intended. It too has a turn for this week. The items above and the fabrics that follow are from Road to California Vendor Mall... 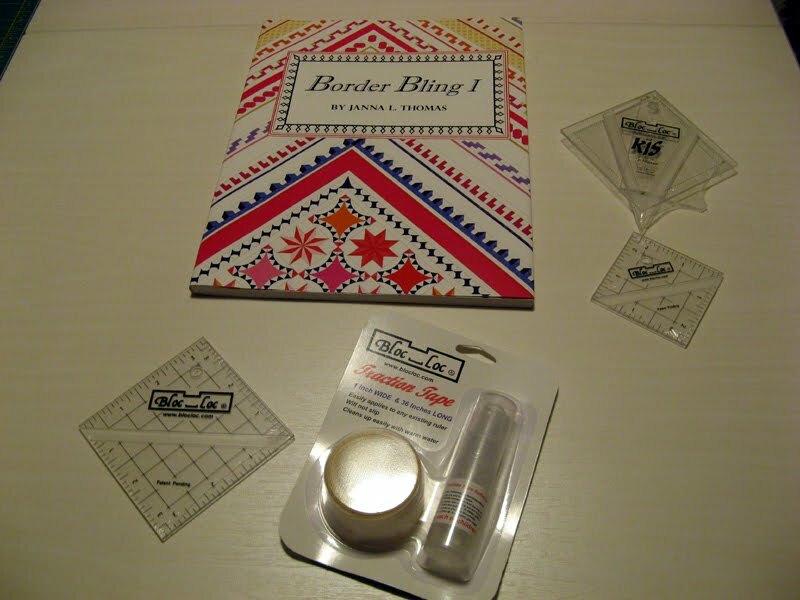 The Border Bling I pattern book, Block Loc rulers, and tape are all products from Block Loc. I am sure you understand by now just how much appreciation I have for this product. 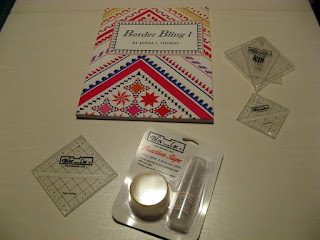 I am looking forward to using the KIS rulers along with several designs for borders. 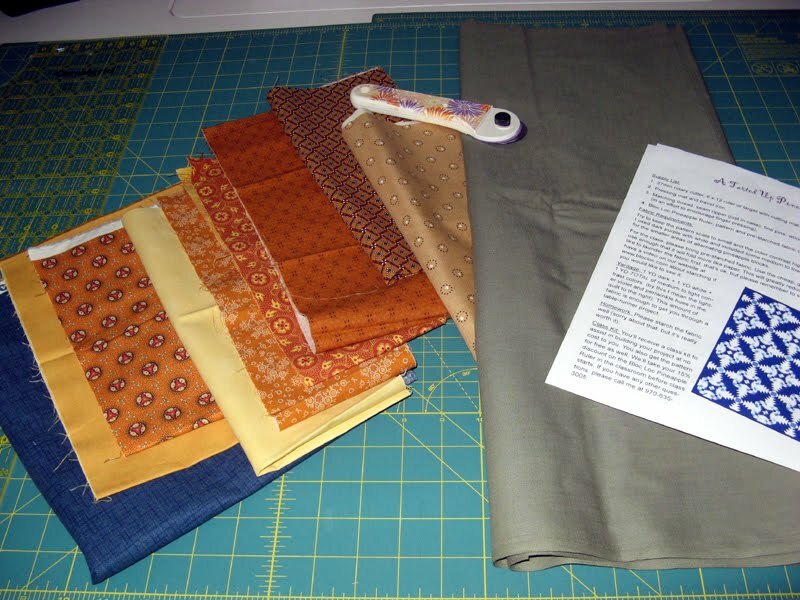 The tape helps hold the fabric in place as one cuts. Sure seemed to have a lot of staying power. I had one charm pack of the Moda Christmas Gatherings by Primitive Gatherings. It seemed as if each time I went to use that one package my design needed two charm packs. Now with two there will be much more flexibility for me when choosing. The black 30s fabric is just because it is so difficult to find black 30s! The 2.5 square pack were a spin the wheel gift from Moda. The pattern Florence Flamingo was a popular offering at the show. One vendor had made the project in the orange/pink fabrics. 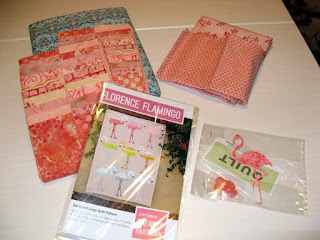 More the look of true flamingos. 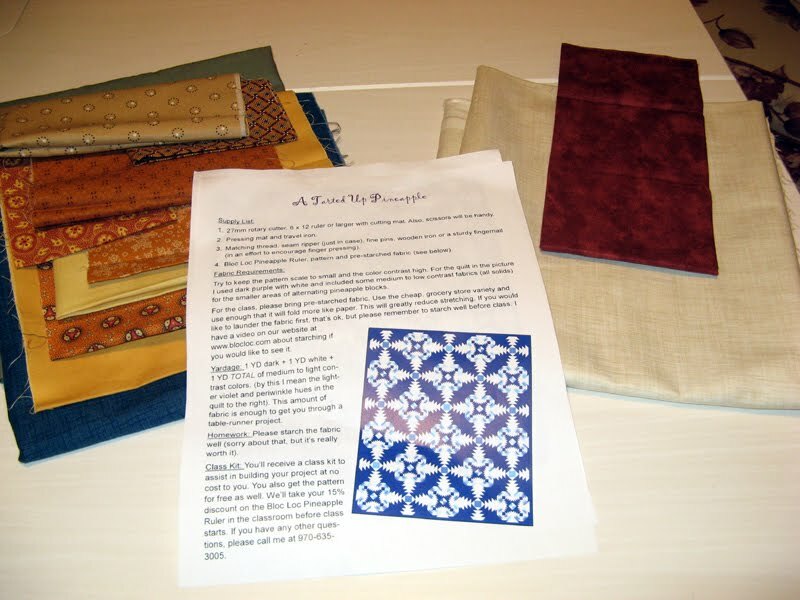 All the kits were of the fabrics shown in the pattern. Of course none carried the orange/pink fabrics. I ended up purchasing two 1/2 yard cuts in the color I desired then I scored with the two 2.5 strip packs which is exactly what the pattern called for...most excellent. The teal blue fabric was a bargain that I couldn't refuse. I will need another yard to piece it for the back, but that will be just fine. Lastly, these are gifts from Kerry. I do love a good word search and a black Frixion pen is perfect for marking. Wish I could have finished something...looking forward to a change next report. I added to my stash today. It is the first purchase of the year. 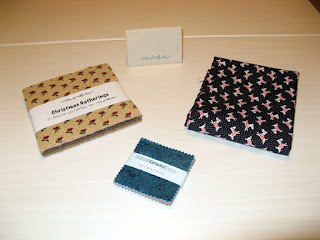 All the fabrics have an immediate use which is a great thing to say :) The blue star fabric is border 3 of Kozy Korners. 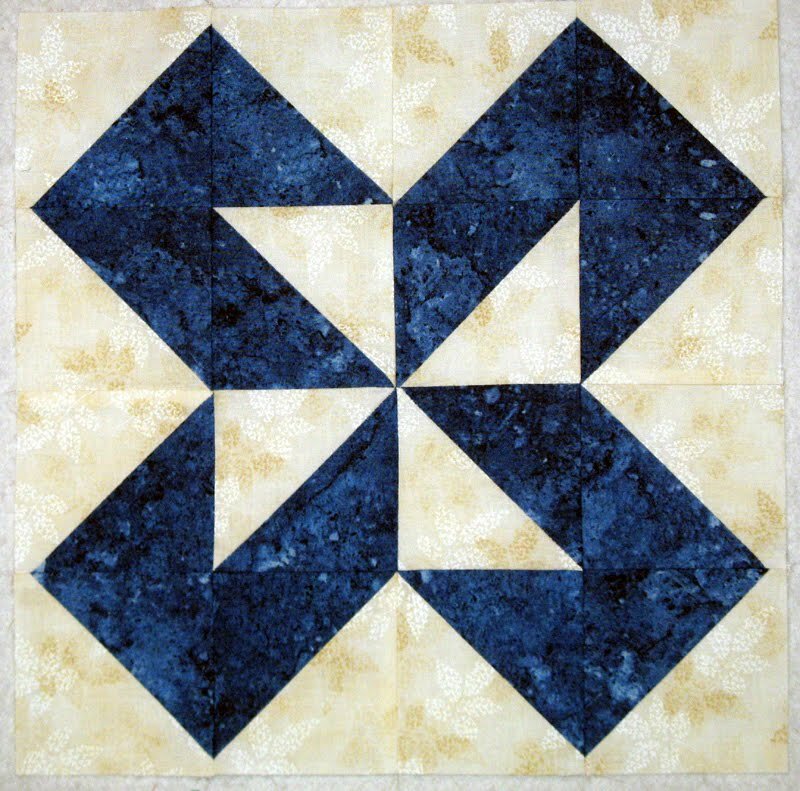 I had hoped to use the solid blue for border 2, but didn't want to make the decision unless I could find something that would work well with it...I did! Still out on the binding although considering the gold used in the sashing. What do you think Mom? Another purchase was for a fabric that will match the new carpet. On the left and above in the photo are three cloth cord covers from scrap that will be used in the office and sewing room to hide the electrical cords that are just way too out of hand. They are tubes of cloth that finish at 3" wide where the cords will slip through. About four cords should fit inside this width. The ones that will use the new fabric will be a bit wider. Their use will be for the stereo equipment where the cords include cables that are larger. The last purchase are the fabrics on the right that finish the fabrics for the Road to California Workshop, A Tarted Up Pineapple. 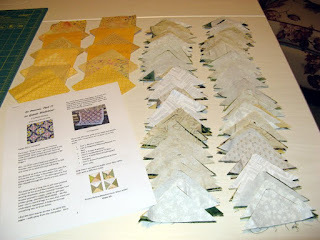 I have some starching to do before leaving on Tuesday evening for the Wednesday class. Nothing graces my Design Wall today, but once Sunday gets here it should be filled with units of En Provence, my Kourtepointe. I am all finished with the "parts" and ready to stitch once my sewing room is unpacked. As I usually do on Mondays, linking in to Patchwork Times. Wishing you a pleasant week. 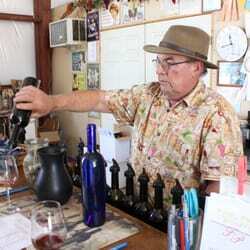 Saturday we met up with Don and Rita for wine tasting in the Temecula Valley. We were very lucky that it was one of the best days of weather over the last week. A new place was found called Foot Path Winery. We arrived fairly late, but were greeted as if we were long time friends by the owner (in the photo). I didn't catch his name...we will certainly learn it during our next visit. Rita and I found ourselves enjoying several red wines; a big surprise for the two of us white wine lovers. Tim left with a gift of a Gold Award Winning 2003 Late Harvest Zinfandel. Rita and I left with a new appreciation for reds. 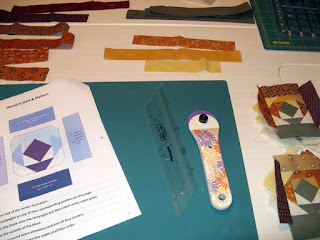 A little bit of sewing during the week, but preparation for the workshop coming on Wednesday at Road to California Quilter's Conference and Showcase along with preparation for the carpet installation that happens on Friday/Saturday. Fabrics are selected and being readied for the class, A Tarted Up Pineapple. 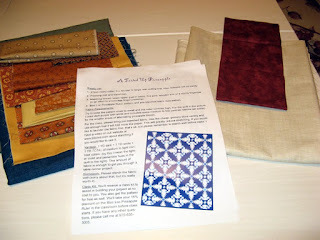 I will be using fabrics in the colors of my home for a small wall-hanging. A brownish green will be my dark, a tanish color will be my light, and several shades of burnt orange and a single blue for the pineapple design. I have a location in mind where it will match the drapes in my kitchen dining area. 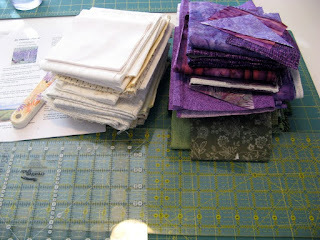 Most of the fabric comes from my stash YIPPEE! For now my stash has no change. Kozy Korners still needs a fabric for the third border and the tanish color needs procuring. There should be a change in the numbers next week...the Vendor Mall at Road to California is one of the best! 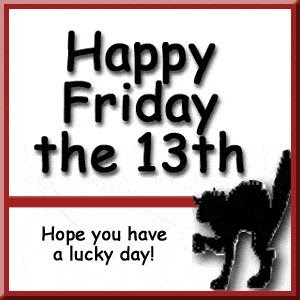 I would have to say I had a wonderful day even if it happened to be the 13th! I stitched this 12.5" block up way ahead of the next meeting. 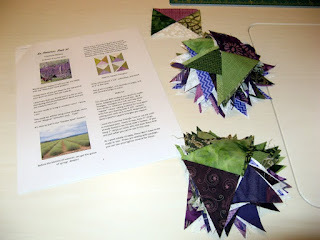 All the piecing is done for my En Provence. Next up will be stitching the blocks together. I hope Sunday will have some time in it for sewing. I have Part 6 of this revealed Mystery, En Provence complete. All the stitching was done on Monday as I had hoped. My friend Bonnie from work clipped the dog ears while I was finger pressing the units open during lunchtime on Tuesday. Tuesday night was Sunshine Quilt Guild monthly meeting so there was no sewing done then. The trunk show and lecture were very interesting. Pretty much everything wool. From how to shop for repurposed wool to the many products available for dying. What a trunk show it was! Although I don't see myself going in this direction at $80 a yard! Okay that was the exception, but really the fabrics are quite expensive to acquire that is not to mention hard to find at any of my area's local quilt shops. Everything for Part 7 is cut and ready for my Thursday evening. This time I will be stitching more of the same unit from Part 6 with gold instead of the purple. It also calls for sets of four 3.5 inch squares of gold. I can't wait to start putting the blocks together. Clever of Bonnie to post the mystery with the border units as Part 1. Love, love, love the reveal! 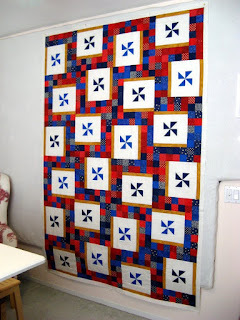 I was in my sewing room most of the weekend enjoying the hum of my machine. I worked until I needed fabric on my last 2016 UFO. Put that project down and picked up Part 6 of Bonnie Hunter's 2016 Winter Mystery. I used the new ruler to make short work out of 2" strips for the quarter square triangle pieces. I think I have found another ruler to add to my favorites next to the Bloc Loc half square triangle ruler. Besides saving a little bit of fabric, the cutting seemed to take no time at all. Above are the 64 units ready to assemble. I kept the same order that Bonnie suggested with the neutral on top. 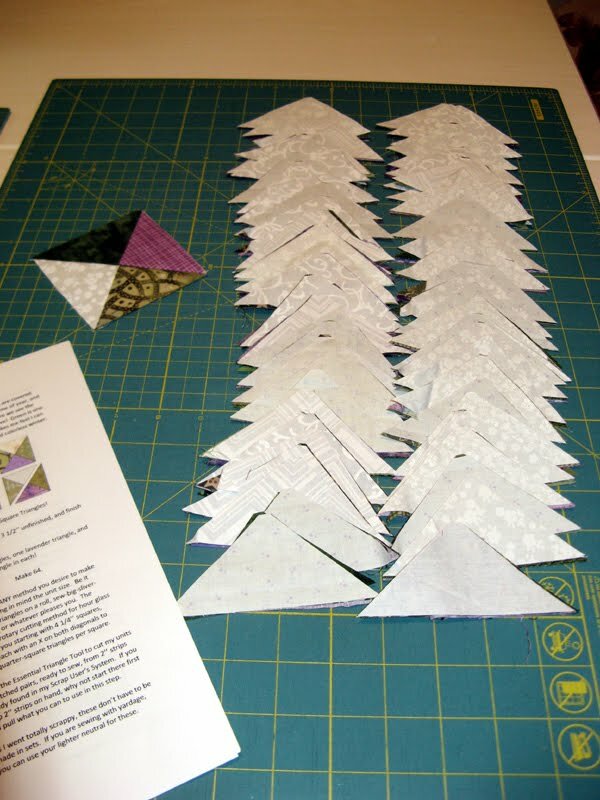 It took no time to send the pieces under the needle along with pressing to the green side. 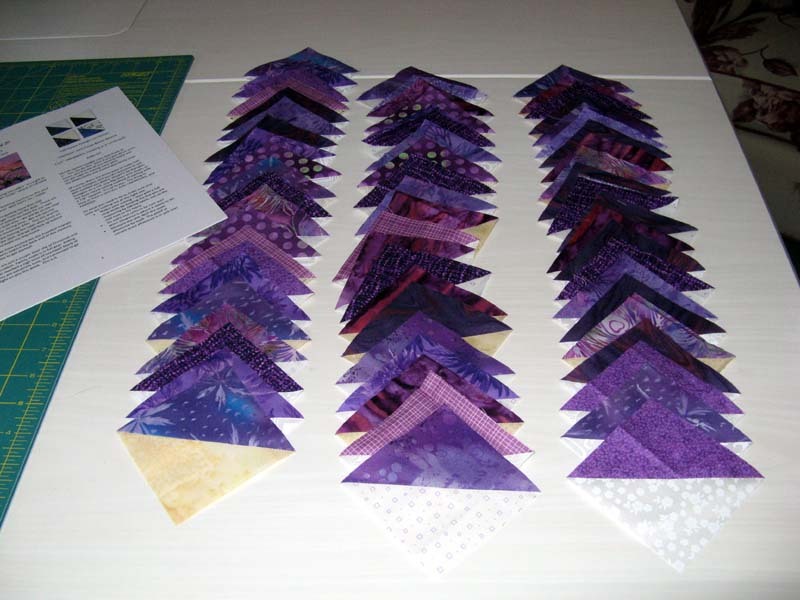 These are stacks of the halves of the finished quarter square triangle unit. Part 7 is already sitting on the table for working once the dishes are done. I have the knack of the new ruler, the cutting should be quick. I am looking forward to seeing the next units of gold, green, and neutral. I hope to finish the cutting and still have enough time to sew Part 6 together later tonight. 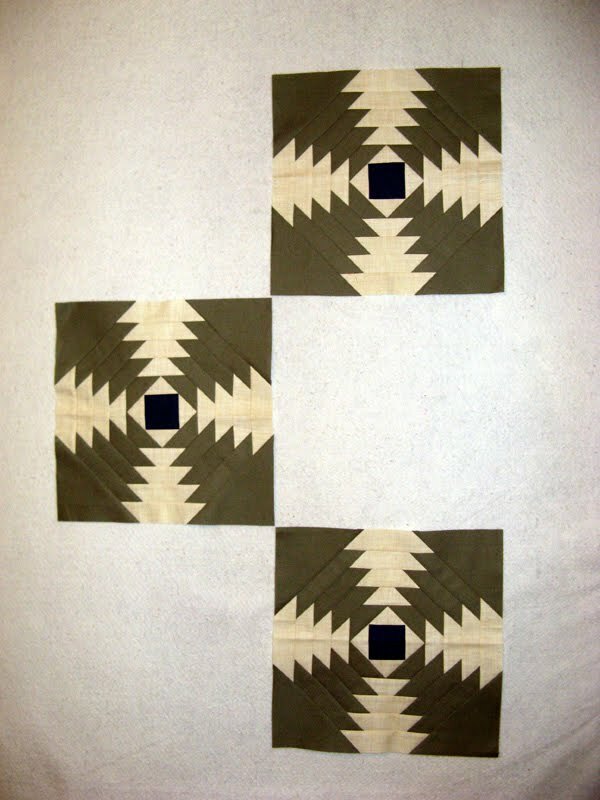 It is difficult to see Border 1 because it is the background fabric, white. 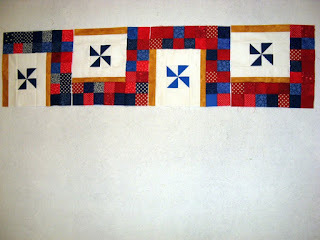 I have enough of the lighter blue pinwheel for Border 2, but will wait until fabric is found for Border 3. Using the fabric is uppermost on my mind. 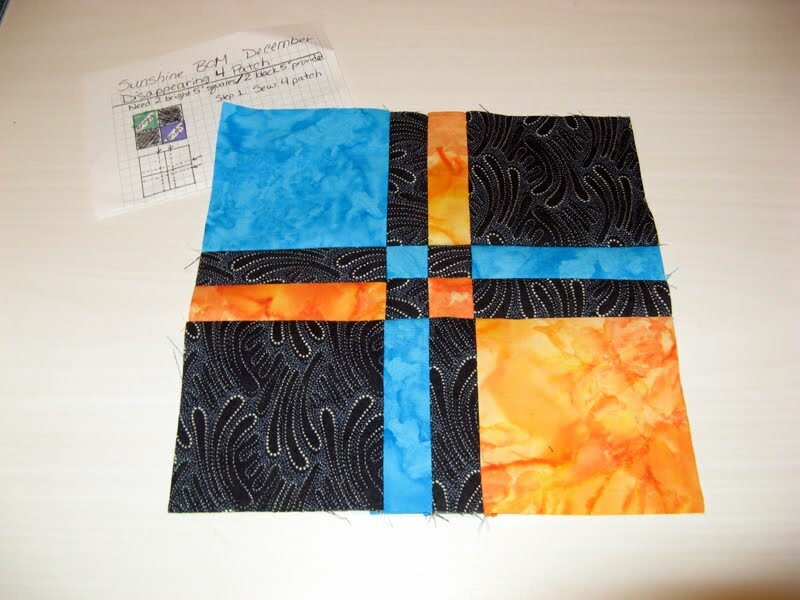 Do not wish to eliminate the possibilities for the last larger border choosing a blue that it must match. I should be able to get to a local quilt shop later this week. Have you ever made one of these disappearing 4-patch blocks? I had not until now that I can remember. It really was fun to make it. Imagine it started with just four squares... Wonder who will be the lucky winner tomorrow night at the guild meeting. Linking in with Patchwork Times. Enjoy your week. No stash to count this week, but I do see it coming for next week. I hope to get to parts beyond Part 5 of En Provence soon. The mystery design really looks great. I have En Provence (my Kourtepointe) as a UFO for 2017. Then there is 2017 UFO #3 Kastaway to get done. I sure don't want to start off not finishing the first UFO of the year. I am a busy quilter this month! See what is going on with stash elsewhere through the links at Patchwork Times. Hope the weather isn't too much of a burden where you are. Enjoy your week. I still have a 2016 UFO project to finish (Kozy Korners) as well as getting up to speed on Bonnie Hunter's 2016 Winter Mystery (Kourtepointe).... I will get there soon, but for the meantime my 2017 UFO projects are set. (The list will always be available on the sidebar.) 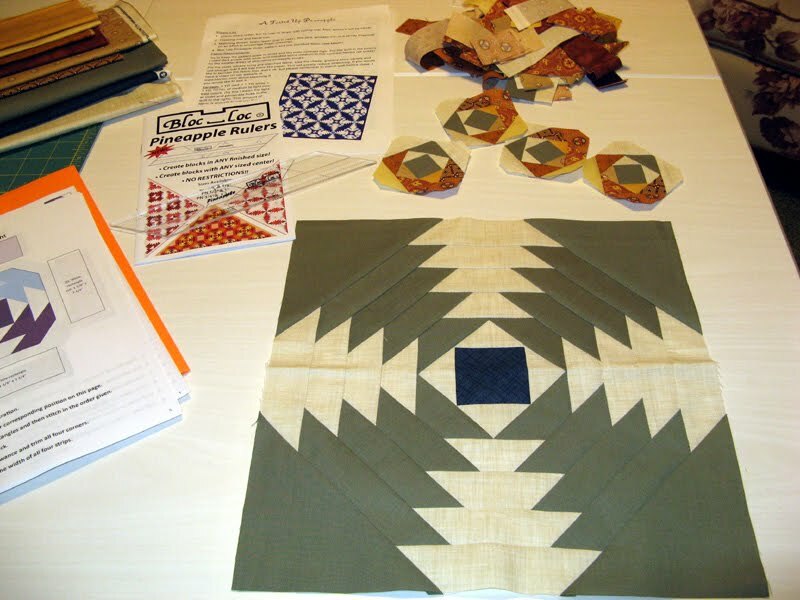 I am participating in Patchwork Times 2017 UFO Challenge. #3 is the project to finish in January. 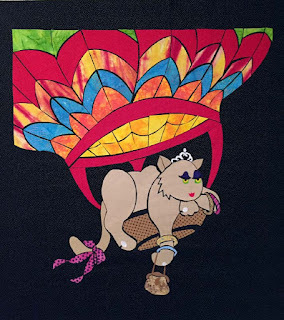 That means my hot air balloon riding kitty will soon be able to fly! My final 2016 UFO is on my Design Wall today. 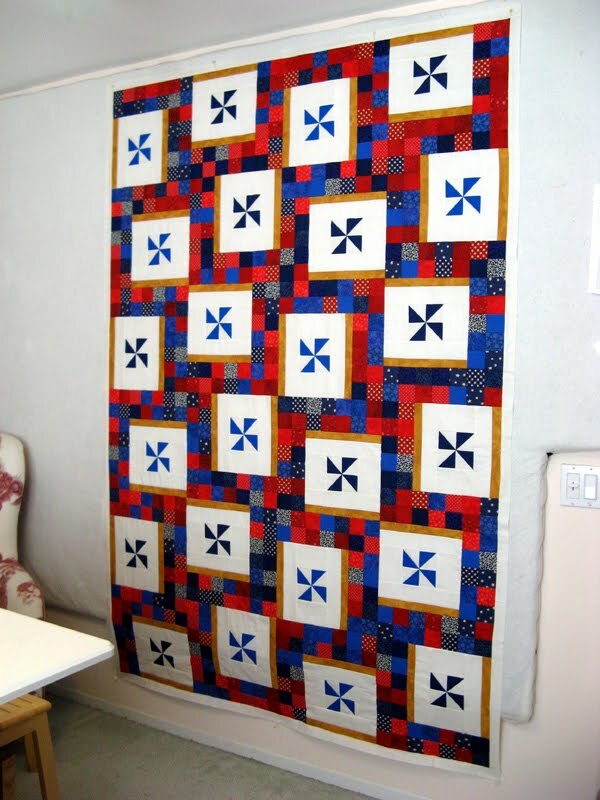 I will be gifting this quilt to my parents for their sewing room/office. They both love patriotic quilts. 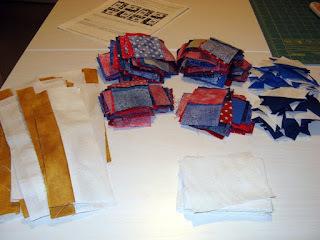 I had in my stash a red/white/blue strip roll purchased from Cozy Quilt Shop many years ago. 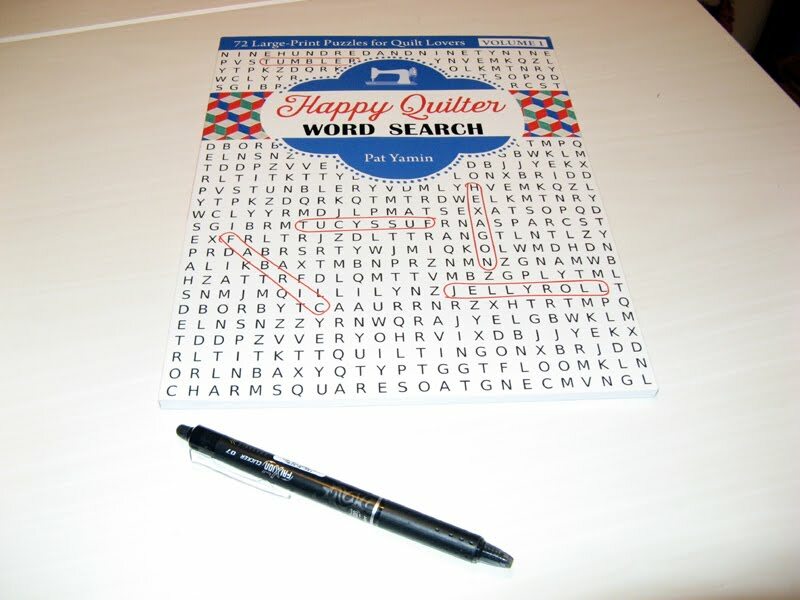 The pattern happens to be also from Cozy Quilt Shop called Lucky Charms. All the units are ready for block assembly. I'll be at work on these this week. I am only up to Part 5 of the Mystery with Bonnie Hunter, but hope to get to the final parts of it once Kozy Korners is complete. Come back later to see my progress. I am linking into Patchwork Times. If you have time see all sorts of projects going on through the links she has on this post. Patchwork Times will run the Stash Report again in 2017. I am happy about this as it is good for me to keep track of what is used and what is purchased. Of course like everyone else it is so much better to use what we have than to purchase new. This being the beginning of the year all stats return to ZERO!